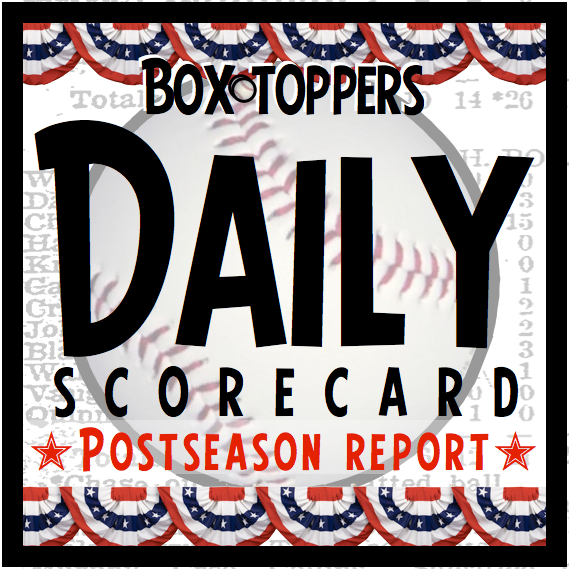 Todd Frazier of the Yankees is Monday’s Box-Toppers Player of the Game in the American League Championship Series Game 3. The Astros lead the best-of-seven series 2-1. Frazier hit a three-run homer and went 1-for-2, scoring twice. Frazier had 1.5 Box-Toppers points in the regular season, earning Player of the Game honors only once on Aug. 9, when he was AL Batter of the Day. He ranked 129th among AL batters. In 2016, he had 6.2 Box-Toppers points with the White Sox. In 2015, he had 8.9 points with the Reds and ranked eighth among NL batters. Frazier had a Box-Toppers game score Monday of +4.0. Teammate CC Sabathia also had a Box-Toppers game score of +4.0 (6IP 3H 0R 4BB 5K W), but in cases of game score ties, batters rank ahead of pitchers. Opposing starting pitcher Charlie Morton of the Astros had a Box-Toppers game score of -15.8 (3.2IP 6H 7R 2BB 3K L). The series resumes with Game 4 Tuesday in New York. Astros—Lance McCullers, 9.4 Box-Toppers points, 49th among all players, 16th among AL pitchers. Yankees—Sonny Gray, 8.4 Box-Toppers points, 68th among all players, 23rd among AL pitchers. ALDS Game 3 on Oct. 8—McCullers appeared in relief and did not earn Player of the Game honors in the 10-3 loss to the Astros. McCullers had a Box-Toppers game score of -2.0 (3IP 3H 2R 2BB 4K ND). Player of the Game was Hanley Ramirez of the Red Sox with a Box-Toppers game score of +5.0. ALDS Game 1 on Oct. 5—Gray started but did not earn Player of the Game honors in the 4-0 loss to the Indians. Gray had a Box-Toppers game score of -7.9 (3.1IP 3H 3R 4BB 3K L). Player of the Game was Indians pitcher Trevor Bauer, who had a Box-Toppers game score of +11.2. Dodgers—Yu Darvish, 13.0 Box-Toppers points, 20th among all players, 11th among NL pitchers. Cubs—Kyle Hendricks, 3.7 Box-Toppers points, ranked 280th among all players, 76th among NL pitchers. Both have earned Player of the Game honors once so far this postseason, Darvish in is only appearance and Hendricks in one of his two appearances. NLDS Game 3 on Oct. 9—Darvish started and earned Player of the Game honors in the 3-1 win over the Diamondbacks with a Box-Toppers game score of +8.0 (5IP 2H R 0BB 7K W). NLDS Game 1 on Oct. 6—Hendricks started and earned Player of the Game honors in the 3-0 win over the Nationals with a Box-Toppers game score of +8.0 (7IP 2H 0R 3BB 6K W). NLDS Game 5 on Oct. 12—Hendricks started but did not earn Player of the Game honors in the 9-8 win over the Nationals. He had a Box-Toppers game score of -7.0 (4IP 9H 4R BB 7K ND). Player of the Game was teammate Addison Russell with a Box-Toppers game score of +3.0.